As a business owner, you’re always wearing several hats while keeping a million different plates spinning. But chances are, you’re not only a business owner; you probably have numerous commitments and priorities going on outside of your business, too. I understand the need to make the most out of the hours that you do have to pour into your business, so today I’m sharing a few practices that have helped me be the most productive with my time. The perfectionist in me never feels like I’ve arrived in this area - there will always be room for improvement - but I do my best to be organized and intentional with every minute I dedicate to Elle & Company. Here’s how. I’m very much a routine kind of person. Routines form habits, and the more and more I complete a task or follow an order of operation, the faster and more efficient I become. It helps me to know what I’m doing when; I love following step-by-step instructions. I have different workflows in place for my client experience, tackling my inbox, writing and publishing blog posts, and working on design projects. I use my workflow chart printable from the Elle & Company Library to keep up with many of these routines, just to be sure I don’t skip a step or miss something important. If you haven’t created workflows for the different facets of your business, this could be a positive game changer for your productivity. Set aside some time to sit down and list each step of your process. It’s also helpful to use this opportunity to be objective and take an honest look at what’s working and what isn’t working in your process. What’s taking up too much time? What could you refine or do differently? Utilizing these workflows will save you time and stress and keep your business running smoothly. Utilizing a calendar is fundamental for keeping up with tasks and making the most out of your time. The longer I’m in business, the more I’ve realized that planning ahead is the key to staying productive. While everyone uses their calendar differently, I’ve found a couple helpful practices for managing my calendar. Color-code to distinguish between categories. I use light blue for blog posts, purple for Elle & Company design projects and meetings, dark blue for personal events like dinner with friends or trips to our hometown, red for meal planning, and gray for church events. This helps me see at a glance how much time I’m dedicating to each category, it helps me find certain events quicker, and it keeps events from blending in and being overlooked. Use daily, weekly, and monthly views. In order to stay productive, I have to see both the small details and the larger picture. I use my Ellebook Planner for my weekly and monthly views, and I schedule the smaller details of my day using my Day Planner worksheet. It’s much easier to see vacations, trips, and client projects in the monthly and weekly views, but I’m able to breakdown my hour-by-hour routine in my daily view. Create daily to-do lists in advance. I set aside one block in my weekly planner for daily to-do lists. 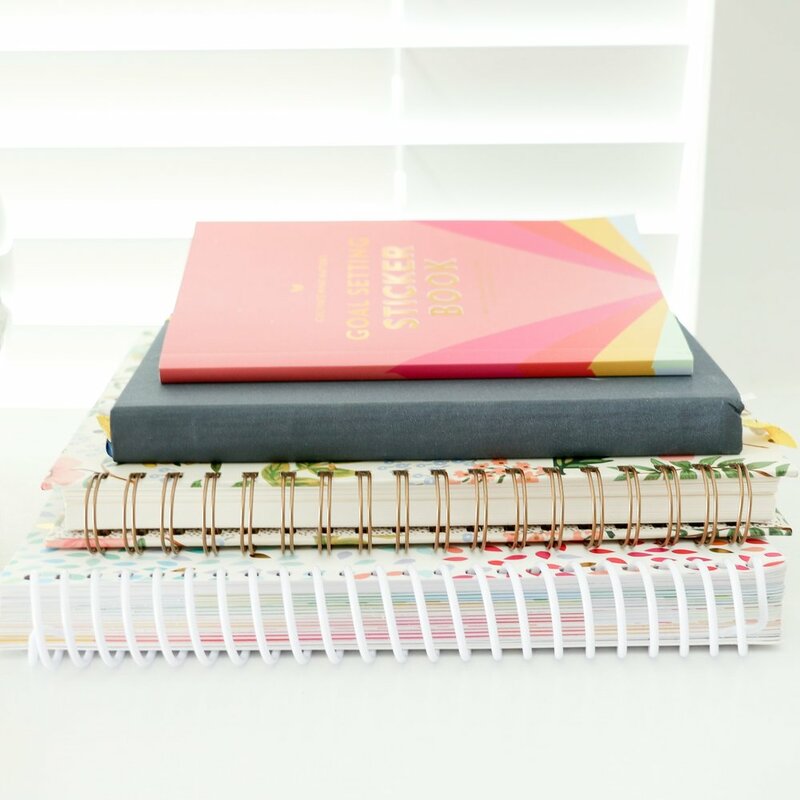 If I know I have a deadline coming up for a guest post or a client meeting, I’ll add in the necessary to-do’s a couple days ahead of the deadline to ensure that I have enough time to get it done and out of the way. 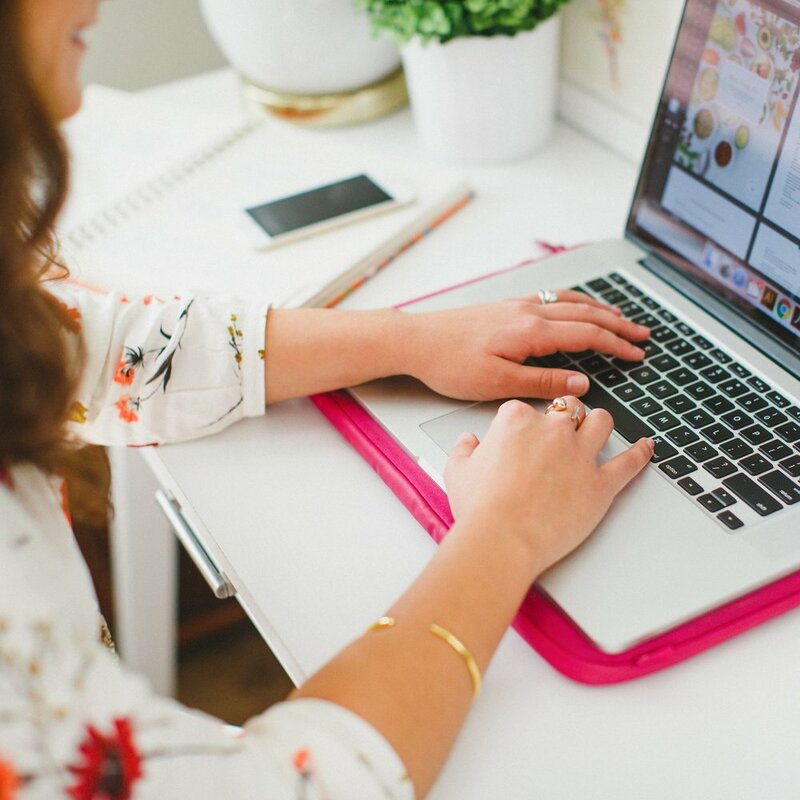 If you’re struggling to keep your head above water in business and blogging, make it a priority to keep up with your planner and find a calendar system that works well for you. Make a habit of writing down events when you book them, planning out to-do’s and tasks ahead of time, and separating your events into different categories to keep everything in order. Blocking out my time not only helps me develop a routine, but it pushes me to get more work done in the hour or two that I’ve allotted to complete a task. Some days I have a meeting at a different time or I have a webinar in the middle of the day, so I shuffle the blocks around or work a little later than 5:00pm to get it all done. Do you try to get several tasks done within one window of time? Whether you work part-time or full-time, time-blocking is helpful for staying on track and focusing on one task at a time. As a perfectionist, I have a tendency to underestimate how much time a task will take me, which often results in falling behind and feeling stressed. To prevent this from happening, I’ve learned to intentionally add in a little extra “cushion” in my schedule for each task or event. For example, if I think it will take me 3 hours to design a client inspiration board, I’ll set aside 4 hours just to be sure I’m giving myself enough time. If I go over that original 3-hour time block, it doesn’t cut into the time I’ve set aside for other tasks. And if I finish the task early, I have some extra time to get a head start on something else. It’s a win-win. Do you have a tendency to underestimate the amount of time it will take you to complete a project or task? Start to add some cushion into your schedule and give yourself some extra time. As a yes-person, this is the area of productivity in which I struggle most. In order to get work done quickly and efficiently, you have to put boundaries in place with your time. This comes in many different shapes and forms. In the world of Instagram, email, and phone notifications, this is much easier said than done. We all know how distracting social media can be and how it hinders productivity. To prevent the temptation to check my phone - especially during my office hours - I turned off all my phone notifications months ago. I also close my email window to keep from checking my inbox when I’m working on client projects. It may sound silly, but checking my phone is a “reward” during built-in work breaks. You wouldn’t believe how much more productive I’ve been since I’ve removed those distractions! It’s made a big difference in the amount of work I’ve been able to get done. Are you constantly tempted to check your phone, reply to a text, or open your inbox? Remove the temptation and avoid those distractions to cross more to-do’s off of your list. You can’t say yes to everything and continue to be productive; there are only so many hours in the day. I’ve learned this the hard way time and time again, and I’ve realized that in order to get things done and get them done well, I have to be more intentional about setting boundaries with my time by saying no to some opportunities. While I would love to take on every project inquiry and side-client possible, I would be sacrificing my nights and my weekends to get it all done. This results in exhaustion, a lack of creativity, stress, and less quality time with my husband. I’ve had to learn that in order to fulfill my current commitments and do my best work, I have to say no more often. Do you take on too much, too? Do yourself a favor by starting to say no and guarding your down time so that you can create your best work and have time to recharge. Meetings have a tendency to go much longer than I originally anticipate, too (thanks to really great industry friends and clients), so I have to put a cap on my meeting times in order to get tasks done and stay on track for the remainder of my day. I’ve learned to be more intentional about scheduling meetings with a start and end time, rather than leaving them open-ended. If you have trouble cutting off meetings or conversations, you might consider doing the same. This not only helps your productivity, but it also allows you to be mindful of your friend’s time, too. Staying productive doesn't have to be a chore or a source of stress. All it takes is a little creativity, some planning, and a lot of discipline, and you'll be making the most out of your schedule in no time! What are some practices that help you stay productive? How do you make the most out of your time?